As I’ve previously mentioned (sadly), Microsoft Edge is to drop its own rendering engine EdgeHTML and replace it with Blink, Google’s one (more of my and others related sadness here, here, here, and here). 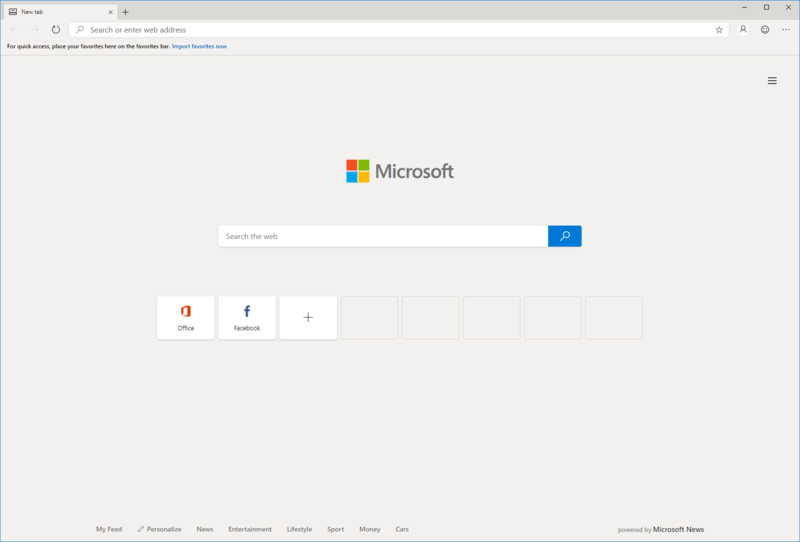 Earlier this month, Microsoft made available the first prerelease versions of the browser, and I gave it a go. At a glance, it looks exactly like you’d expect a Microsoft reskin of Chrome to look, right down to the harmonised version numbers. All of the Chrome-like features you’d expect are there, including support for Chrome plugins, but Microsoft have also clearly worked to try to integrate as much as possible of the important features that they felt were distinct to Edge in there, too. For example, Edge Blink supports SmartScreen filtering and uses Microsoft accounts for sync, and Incognito is of course rebranded InPrivate. But what really interested me was the approach that Edge Dev has taken with Progressive Web Apps. 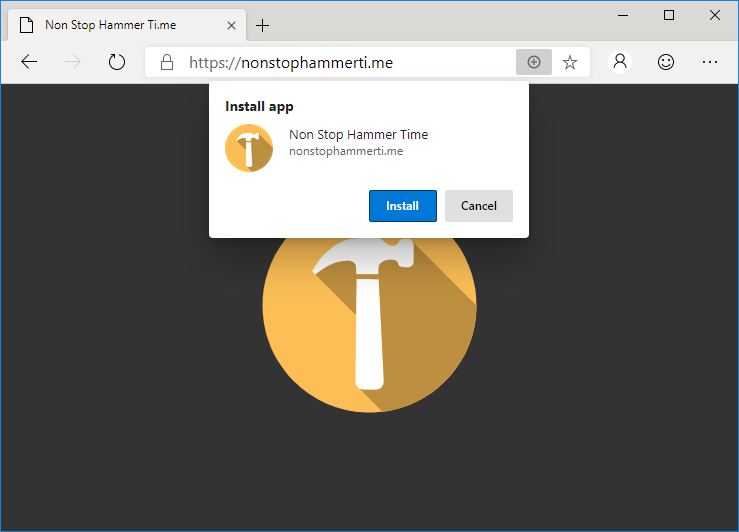 NonStopHammerTi.me might not be the best PWA in the world, but it’s the best one linked from this blog post. Edge Dev may go further than any other mainstream browser in its efforts to make Progressive Web Apps visible to the user, putting a plus sign (and sometimes an extended install prompt) right in the address bar, rather than burying it deep in a menu. Once installed, Edge PWAs “just work” in exactly the way that PWAs ought to, providing a simple and powerful user experience. Unlike some browsers, which make installing PWAs on mobile devices far easier than on desktops, presumably in a misguided belief in the importance of mobile “app culture”, it doesn’t discriminate against desktop users. It’s a slick and simple user experience all over. Once installed, Edge immediately runs your new app (closing the tab it formerly occupied) and adds shortcut icons. 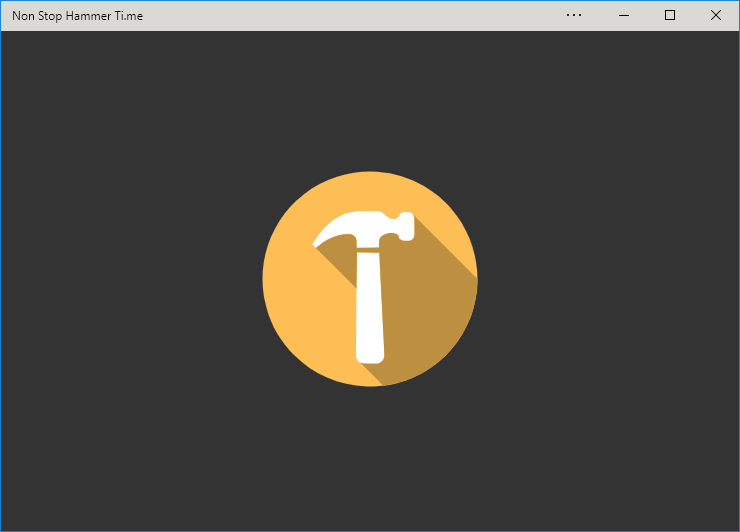 Feature support is stronger than it is for Progressive Web Apps delivered as standalone apps via the Windows Store, too, with the engine not falling over at the first sign of a modal dialog for example. Hopefully (as I support one of these hybrid apps!) these too will begin to be handled properly when Edge Dev eventually achieves mainstream availability. 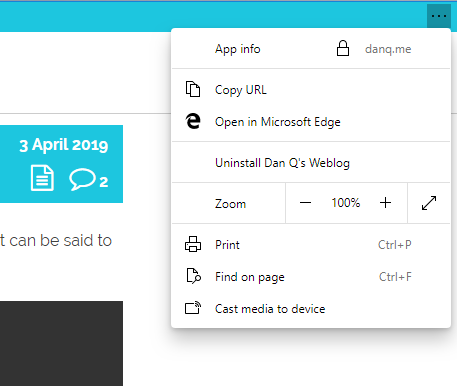 If you’ve got the “app” version installed, Edge provides a menu option to switch to that from any page on the conventional site (and cookies/state is retained across both). But perhaps most-impressive is Edge Dev’s respect for the importance of URLs. If, having installed the progressive “app” version of a site you subsequently revisit any address within its scope, you can switch to the app version via a link in the menu. I’d rather have seen a nudge in the address bar, where the user might expect to see such things (based on that being where the original install icon was), but this is still a great feature… especially given that cookies and other state maintainers are shared between the browser, meaning that performing such a switch in a properly-made application will result in the user carrying on from almost exactly where they left off. Unlike virtually every other PWA engine, Edge Dev’s provides a “Copy URL” feature even to apps without address bars, which is a killer feature for sharability. Similarly, and also uncommonly forward-thinking, Progressive Web Apps installed as standalone applications from Edge Dev enjoy a “copy URL” option in their menu, even if the app runs without an address bar (e.g. 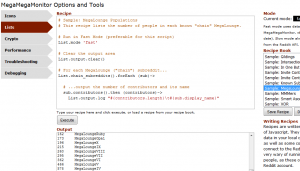 as a result of a "display": "standalone" directive in the manifest.json). This is a huge boost to sharability and is enormously (and unusually) respectful of the fact that addresses are the Web’s killer feature! Furthermore, it respects the users’ choice to operate their “apps” in whatever way suits them best: in a browser (even a competing browser! ), on their mobile device, or wherever. Well done, Microsoft! 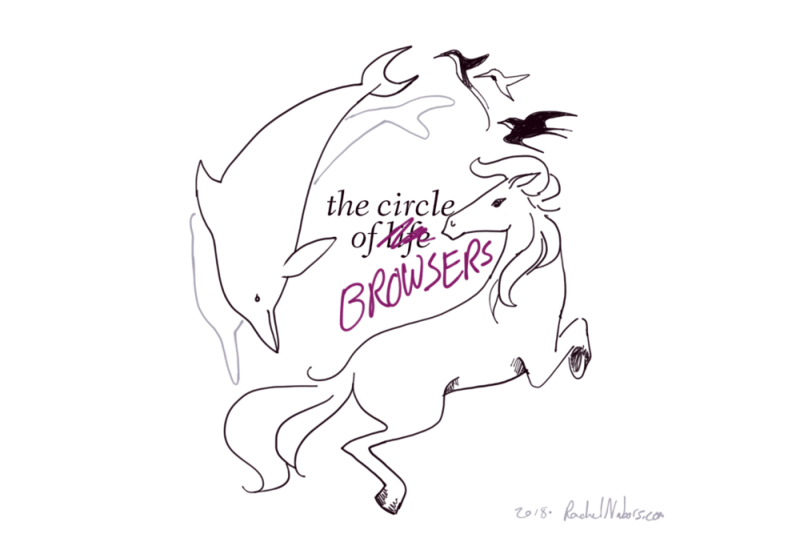 I’m still very sad overall that Edge is becoming part of the Chromium family of browsers. But if the silver lining is that we get a pioneering and powerful new Progressive Web App engine then it can’t be all bad, can it? “Thought: It’s time for @mozilla to get down from their philosophical ivory tower. The web is dominated by Chromium, if they really *cared* about the web they would be contributing instead of building a parallel universe that’s used by less than 5%?” He made it clear the viewpoint was his personal opinion, not Microsoft’s position. Mozilla is indeed in a sticky situation, trying to improve the web when it comes to things like openness, privacy and new standards. That mission is harder with declining influence, though, and Firefox now accounts for 5 percent of web usage, according to analytics firm StatCounter. But without independent efforts like Firefox, and to an extent Apple’s Safari, the web will stop being an independent software foundation and become whatever Google says it is. And plenty of people don’t like that one bit. Indeed, Mozilla defenders see the nonprofit’s mission as even more important with Chrome’s dominance. We need a movement of developers and enthusiasts who loudly, proudly, use @mozilla @firefox as their primary browser. On our desktops and our laptops. We test in it, extend it, contribute to it. But we never, ever, take it for granted. The moment I came to this conclusion. Background: 1, 2, 3, 4, 5, 6, and with thanks to Jeremy Keith for helping me see it. Very much this. I’ve been using Firefox as my primary browser since I began (gradually) switching from Opera in 2005, but it’s never been more important than it is now that people know about and use Firefox. The rest of his post, which summarises the news I was talking about the other week and everything people have said since, is well-worth reading too. We need a new movement: a movement of developers, influencers, and tech enthusiasts who loudly, proudly, use Firefox as their primary web browser. We use it on our desktops. We use it on our laptops. We use it on our phones. All of us test sites in it. Some of us write plugins for it. The bravest of us write code for it. But none of us, not one, takes it for granted. Will Microsoft’s decision make it harder for Firefox to prosper? It could. Making Google more powerful is risky on many fronts. […] If one product like Chromium has enough market share, then it becomes easier for web developers and businesses to decide not to worry if their services and sites work with anything other than Chromium. That’s what happened when Microsoft had a monopoly on browsers in the early 2000s before Firefox was released. And it could happen again. Before you lament the return to a Microsoft-like monopoly, remember what happened to Microsoft’s monopoly. In fact, remember what happened to the lineal descendant of that monopoly just last week. Near-monopolies do not necessarily mean the end of the web. Yet more in the “EdgeHTML to be replaced by Chromium” story, on which I already shared my opinions. Peter-Paul does a good job of illustrating the differences between the reduction of diversity in/increasing monopolisation of the browser space this time around and last time (when Internet Explorer 6 became the de facto standard way to surf the Web), using it to provide a slightly less-pessimistic outlook (albeit one not without its warnings). 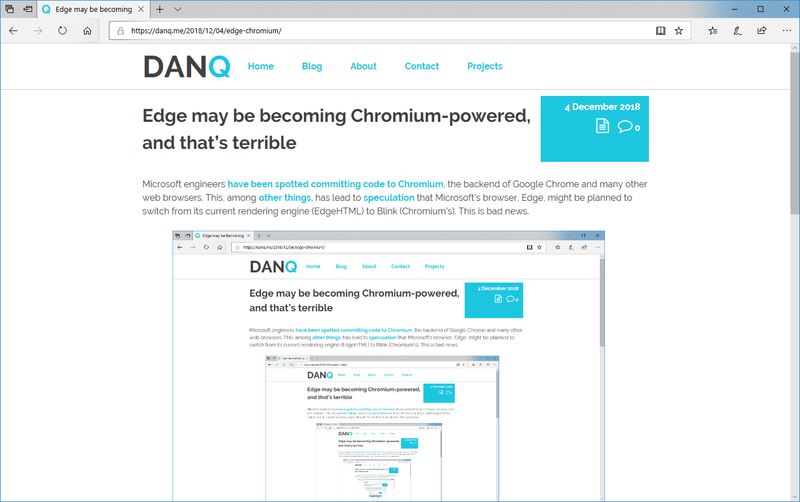 Yet more fallout from the Microsoft announcement that Edge will switch to Chromium, which I discussed earlier. This one’s pretty inspirational, and gives a good reminder about what our responsibilities are to the Web, as its developers. Microsoft engineers have been spotted committing code to Chromium, the backend of Google Chrome and many other web browsers. This, among other things, has lead to speculation that Microsoft’s browser, Edge, might be planned to switch from its current rendering engine (EdgeHTML) to Blink (Chromium’s). This is bad news. This post, as it would appear if you were looking at it in Edge. Which you might be, I suppose. Once upon a time – let’s call it the mid-1990s – there were several web browsers: Netscape Navigator, Internet Explorer, Opera, etc. 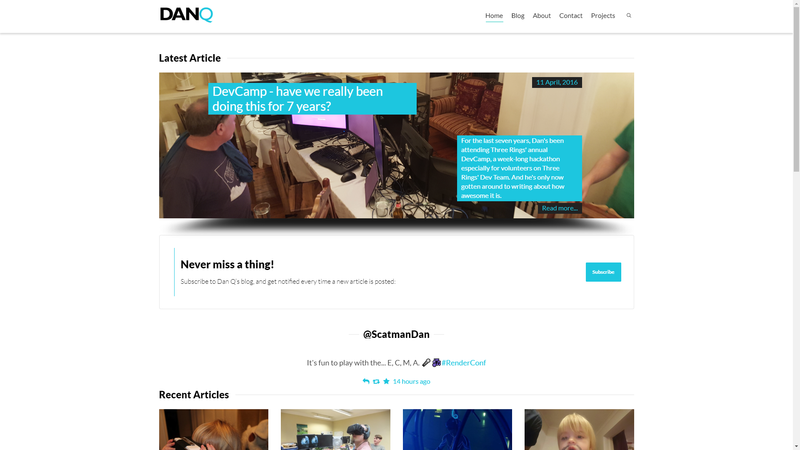 They all used different rendering engines and so development was sometimes a bit of a pain, but only if you wanted to use the latest most cutting-edge features: if you were happy with the standard, established features of the Web then your site would work anywhere, as has always been the case. Developers started targeting only that one browser: instead of making websites, developers started making “Internet Explorer sites” which were only tested in that one browser or, worse yet, only worked at all in that browser, actively undermining the Web’s position as an open platform. As the grip of the monopoly grew tighter, technological innovation was centred around this single platform, leading to decade-long knock-on effects. The Web ceased to grow new features: from the release of Internet Explorer 6 there were no significant developments in the technology of the Web for many years. The lack of competition pushed us into a period of stagnation. A decade and a half later, we’re only just (finally) finishing shaking off this unpleasant bit of our history. History looks set to repeat itself. Substitute Chrome in place of Internet Explorer and update the references to other web browsers and the steps above could be our future history, too. Right now, we’re somewhere in or around step #2 – Chrome is the dominant browser – and we’re starting to see the beginnings of step #3: more and more “Chrome only” sites. More-alarmingly this time around, Google’s position in providing many major Web services allows them to “push” even harder for this kind of change, even just subtly: if you make the switch from Chrome to e.g. Firefox (and you absolutely should) you might find that YouTube runs slower for you because YouTube’s (Google) engineers favour Google’s web browser. Imagine a planet populated only by hummingbirds, dolphins, and horses. Say all the dolphins died out. In the far, far future, hummingbirds or horses could evolve into something that could swim in the ocean like a dolphin. Indeed, ichthyosaurs in the era of dinosaurs looked much like dolphins. But that creature would be very different from a true dolphin: even ichthyosaurs never developed echolocation. We would wait a very long time (possibly forever) for a bloodline to evolve the traits we already have present in other bloodlines today. So, why is it ok to stand by or even encourage the extinction of one of these valuable, unique lineages? We have already lost one. We used to have four major rendering engines, but Opera halted development of its own rendering engine Presto before adopting Blink. Three left. Spend them wisely. Update: this is now confirmed. A sad day for the Web. 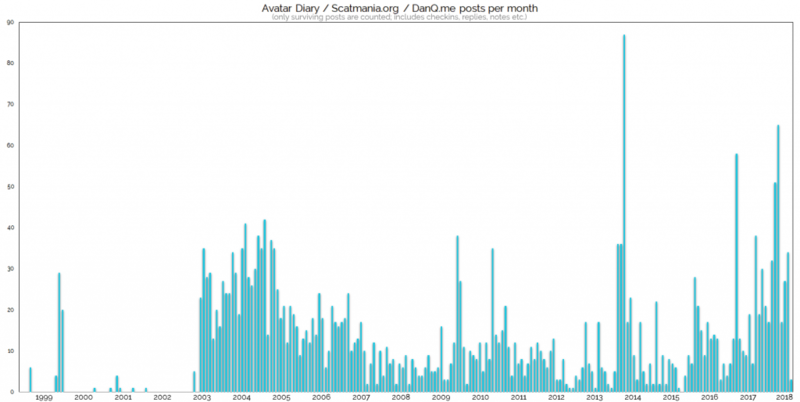 What it means for something to be of the web has been discussed many times before. While the technical test can be reasonably objective – is it addressable, accessible and available – culturally it remains harder to judge. But I don’t know about you, I’ve found that certain websites feel more ‘webby’ than others. Despite being nonspecific on the nature of the feeling he describes, Paul hits the nail on the head. 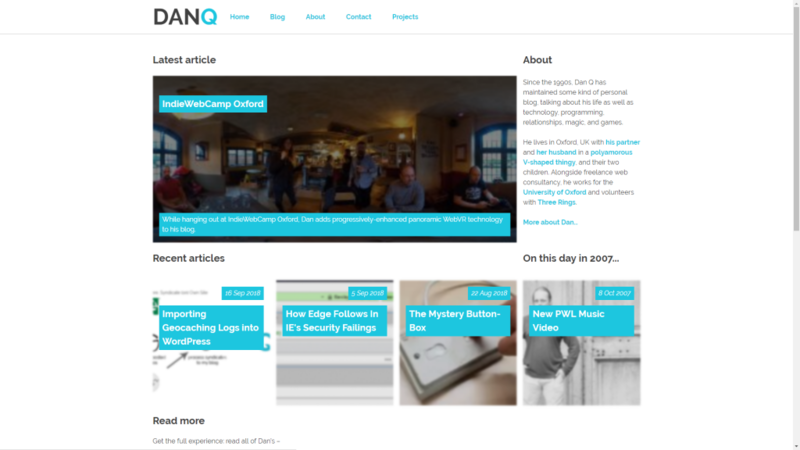 Your favourite (non-Medium) blog or guru site almost certainly has that feel of being “of the web”. Your favourite API-less single-page app (with the growing “please use in Chrome” banner) almost certainly does not. I’ve generally been pretty defensive of Microsoft Edge, the default web browser in Windows 10. Unlike its much-mocked predecessor Internet Explorer, Edge is fast, clean, modern, and boasts good standards-compliance: all of the things that Internet Explorer infamously failed at! I was genuinely surprised to see Edge fail to gain a significant market share in its first few years: it seemed to me that everyday Windows users installed other browsers (mostly Chrome, which is causing its own problems) specifically because Internet Explorer was so terrible, and that once their default browser was replaced with something moderately-good this would no longer be the case. But that’s not what’s happened. Maybe it’s because Edge’s branding is too-remiscient of its terrible predecessor or maybe just because Windows users have grown culturally-used to the idea that the first thing they should do on a new PC is download a different browser, but whatever the reason, Edge is neglected. And for the most part, I’ve argued, that’s a shame. But I’ve changed my tune this week after doing some research that demonstrates that a long-standing security issue of Internet Explorer is alive and well in Edge. This particular issue, billed as a “feature” by Microsoft, is deliberately absent from virtually every other web browser. 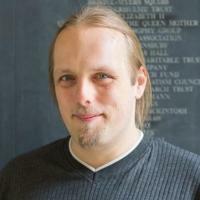 About 5 years ago, Steve Gibson observed a special feature of EV (Extended Validation) SSL certificates used on HTTPS websites: that their extra-special “green bar”/company name feature only appears if the root CA (certificate authority) is among the browser’s default trust store for EV certificate signing. That’s a pretty-cool feature! It means that if you’re on a website where you’d expect to see a “green bar”, like Three Rings, PayPal, or HSBC, then if you don’t see the green bar one day it most-likely means that your connection is being intercepted in the kind of way I described earlier this year, and everything you see or send including passwords and credit card numbers could be at risk. This could be malicious software (or nonmalicious software: some antivirus software breaks EV certificates!) or it could be your friendly local network admin’s middlebox (you trust your IT team, right? ), but either way: at least you have a chance of noticing, right? 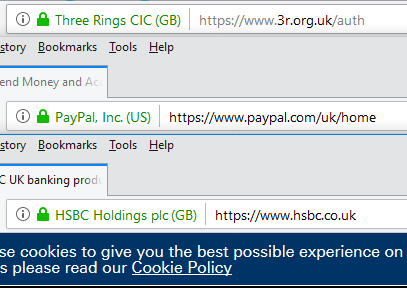 Firefox, like most browsers, shows the company name in the address bar when valid EV certificates are presented, and hides it when the validity of that certificate is put into question by e.g. network sniffing tools set up by your IT department. Browsers requiring that the EV certificate be signed by a one of a trusted list of CAs and not allowing that list to be manipulated (short of recompiling the browser from scratch) is a great feature that – were it properly publicised and supported by good user interface design, which it isn’t – would go a long way to protecting web users from unwanted surveillance by network administrators working for their employers, Internet service providers, and governments. Great! Except Internet Explorer went and fucked it up. As Gibson reported, not only does Internet Explorer ignore the rule of not allowing administrators to override the contents of the trusted list but Microsoft even provides a tool to help them do it! From top to bottom: Internet Explorer 11, Edge 17, Firefox 61, Chrome 68. Only Internet Explorer and Edge show the (illegitimate) certificate for “Barclays PLC”. Sorry, Barclays; I had to spoof somebody. I decided to replicate Gibson’s experiment to confirm his results with today’s browsers: I was also interested to see whether Edge had resolved this problem in Internet Explorer. My full code and configuration can be found here. As is doubtless clear from the title of this post and the screenshot above, Edge failed the test: it exhibits exactly the same troubling behaviour as Internet Explorer. I also tried Safari (both on MacOS, above, and iOS, below) and it behaved as the other non-Microsoft browsers do (i.e. arguably more-correctly than IE or Edge). I shan’t for a moment pretend that our current certification model isn’t without it’s problems – it’s deeply flawed; more on that in a future post – but that doesn’t give anybody an excuse to get away with making it worse. When it became apparent that Internet Explorer was affected by the “feature” described above, we all collectively rolled our eyes because we didn’t expect better of everybody’s least-favourite web browser. But for Edge to inherit this deliberate-fault, despite every other browser (even those that share its certificate store) going in the opposite direction, is just insulting. Microsoft recently tweeted: “It’s not often that we encourage you to stop using one of our products, but for IE6, we’ll make an exception”. This coincides with the launch of The Internet Explorer 6 Countdown, a website that tries to encourage people to drop this hideously old and awful browser in favour of better, modern, standards-compliant ones, thereby saving web developers heaps of work. 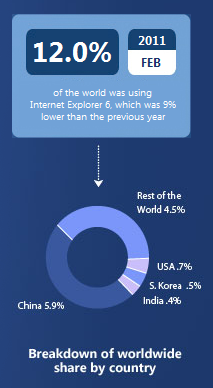 Internet Explorer 6 usage stats, from IE6 Countdown. I'm honestly shocked that the number is still as high as 12%. Where are they getting that from? That’s not strictly true; they’re encouraging people to upgrade to Internet Explorer 8 and 9, presumably, which are still a little lacking in support for some modern web standards. But they’re a huge step forward, and everybody who’d like to stick with Internet Explorer should be encouraged to upgrade. There’s no excuse for still using IE6. They’re even providing a tool to let you put a “Upgrade now, damnit!” banner on your website, visible only to IE6 users. It’s similar to the IE6Update tool, really, but has the benefit of actually being supported by the browser manufacturer. That has to count for something. Will it make a difference? I don’t know. I’m frankly appalled that there are modern, high-tech countries that still have significant numbers of IE6 users: Japan counts over 10%, for example! We’re talking here about a ten year old web browser: a web browser that’s older than MySpace, older than Facebook, older than GMail, older than YouTube. Internet Explorer 6 was released into a world where Lord of the Rings that would take you a long time to read, rather than taking you a long time to watch. A world where in-car CD players still weren’t universal, and MP3 players were a rarity. Do you remember MiniDisc players? Internet Explorer 6 does. The World Trade Center? Those towers were still standing when Internet Explorer was released to the world. And if that’s making you think that 10 years is a long time, remember that in the fast-changing world of technology, it’s always even longer. Just remember what Microsoft (now, at long last) says: Friends don’t let friends use Internet Explorer 6. Favourite Firefox Four Feature FAIL! App tabs. You’re now able to turn tabs into small tabs which sit at the left-hand side. Tab groups. 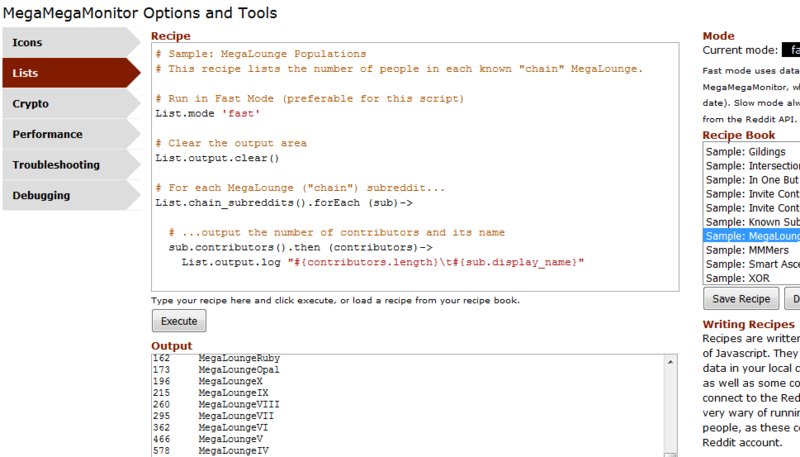 You can “group” your tabs and display only a subset of them at once. Group all of my SmartData/Three Rings/personal tabs into tab groups, accordingly. This includes the webmail tab for each of them, which is kept as an App Tab – so my SmartData webmail is an app tab which is in the SmartData tab group, for example. Then – and here’s the awesome bit – a can switch between my tab groups just be clicking on the relevant app tab! Time to do some SmartData work? I just click the SmartData webmail app tab and there’s my e-mail, and the rest of the non-app tabs transform magically into my work-related tabs: development versions of the sites I’m working on, relevant APIs, and so on. Time to clock off for lunch? I click on the personal webmail tab, look at my e-mail, and magically all of the other tabs are my personal ones – my RSS feeds, the forum threads I’m following, and so on. Doing some Three Rings work in the evening? 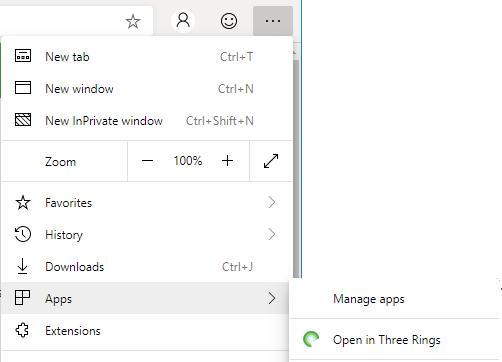 I can click the Three Rings webmail tab and check my mail, and simultaneously the browser presents me with the Three Rings related tabs I was working on last, too. It was fabulous. I can’t fix this by making them into regular tabs, because then they won’t all be shown. I’m painfully familiar about what happens when people treat a bug as a feature. Some years ago, a University Nightline were using a bug in Three Rings as a feature, and were outraged when we “fixed” it. Eventually, we had to provide a workaround so that they could continue to use the buggy behaviour that they’d come to depend upon. So please, Mozilla – help me out here and at least make an about:config option that I can switch on to make app tabs belong to specific tab groups again (but still be always visible). It was such an awesome feature, and it saddens me that you made it by mistake. Have you seen the latest stupidity that the Windows Internet Explorer team have come up with? Ten Grand Is Buried Here. The idea is that they encourage you to give up whatever browser you’re using (assuming it’s not Internet Explorer 8), calling it names (like “old Firefox” if you’re using Firefox, “boring Safari” if you’re using Safari, “tarnished Chrome” if you’re using Chrome, and… “that browser” if you’re using Opera) and upgrade to Internet Explorer 8, and they’ll be giving out clues on their Twitter feed about some secret website that’ll only work in IE8 at which you can register and win $10,000AUS (yes, this is an Australian competition). 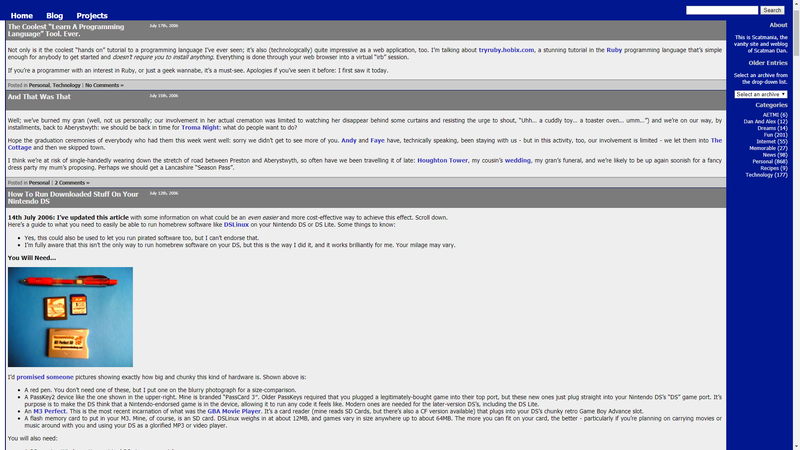 After looking at the site in Firefox, Safari, Chrome, and Opera, I thought I’d give it a go in Internet Explorer 8. But it didn’t work – it mis-detected my installation of IE8 as being IE7 (no, I didn’t have Compatability Mode on). In the end, though, I just used User Agent Switcher to make my copy of Firefox pretend to be Internet Explorer 8. Then it worked. So basically, all that I’ve learned is that Firefox does a better job of everything that Internet Explorer does, including viewing websites designed to only work in Internet Explorer. Good work, Microsoft. Have a slow clap.